My view from the front porch of 1600 Pennsylvania Ave.
Last week I joined my fellow State Teachers of the Year in DC for Washington Week: we met the leader of the free world, 44th President of the United States, and pretty darn handsome man, Barack Obama. We also met six-term senator, one of my favorite living rhetoricians, Vice President of the United States, “Uncle” Joe Biden and his (possibly more impressive) wife Dr. Jill Biden. We also met the Human Reset Button, the walking embodiment of bureaucratic tone change, Secretary of Education, Dr. John King. Secret Service check heading into the Biden Residence. On side trips, my wife and I visited the Ford Theater, where the namesake of my school, Abraham Lincoln, was shot by treasonous Confederate (those terms are admittedly redundant), John Wilkes Booth and Arlington National Cemetery. And last week at the invitation of CCSSO, I gave a policy talk on recruiting and retaining effective teachers of color, to members of the Whitehouse Staff and employees from the Department of Education. In short fam, we had a helluva week in DC. Policy Briefing to Whitehouse staff and employees of the Department of Education. A Bit of a Whirlwind: Each year the 56... 55 (North Dakota just had a baby) State and territorial (DOD, Guam, Marianas Islands, Virgin Islands American Samoa and DC) teachers of the year gather in DC for Washington Week. It is intended to be a celebration of the profession. But recently, it has morphed into something more. The event is turning into a forum, where policymakers and ed groups seek input from practitioners from around the nation (and its territories). This year we were provided an opportunity to give (often very frank) feedback to several ed organizations (NWEA, Pearson, ETS, Microsoft Education) on their policy platforms and upcoming initiatives in sessions called “Educator Perspective Breakouts.” I often talk about the need to include effective teacher voice in education policy formulation, I applaud those orgs specifically for listening to our collective points-of-view around PD, evaluation and assessment and seeking to create an ongoing dialogue around their work and ours. I don’t think we shifted the trajectory of their already laid plans, but we were invited to a conversation (a start) and we will see where that leads in the longterm. 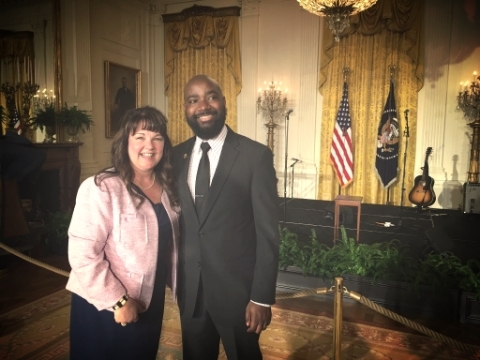 In the East Room with 2016 Alaska Teacher of the Year, Amy Jo Meiners. While we were in DC some of the SToYs talked about how they’ve received pushback from colleagues when they’ve raised issues of teacher quality and effectiveness. But, I think Shawn Sheehan, fellow NToY Finalist, and candidate for Oklahoma State Senate, nailed it, and for the sake of my kids I unapologetically co-sign: “those who can’t, definitely shouldn’t teach.” It really is that simple. The work is too important to believe otherwise. Back to Home and My Reality: Upon returning to the real Washington, I felt physically exhausted, but pedagogically inspired. Within 12 hours of landing, I was back at Lincoln leading our final AP Exam review session to a standing-room crowd of Abes, in preparation for today’s AP Government & Politics exam. Somewhere over flyover country, masquerading as Jupiter. Within 24 hour hours, Audrey, Massachusetts Teacher of the Year, was proposing a collaborative story telling project to the SToYs. In the same timeframe, Talya from Maine was writing about her experiences in DC. Within 36 hours, I had started house hunting on Redfin, looking to recruit frustrated SToYs from states where they don’t feel as supported to work, teach and live in Tacoma. DC was surreal at times, but it reminded me of the immediacy of the work we do here at Lincoln and in the South Sound with Teachers United. This work matters: Teachers are loved. Teachers aren’t appreciated. This work is draining. This work is energizing. This work often seems impossible. This work is always essential. These are the contradictions we live with.